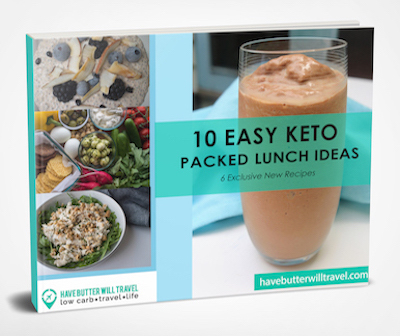 We love burgers here at Have Butter will Travel and these keto chicken burgers are no different. 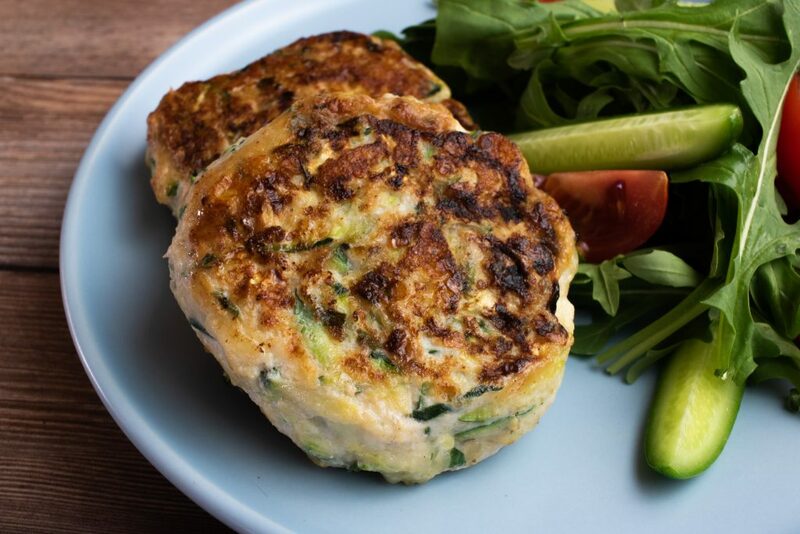 This keto chicken burger recipe uses halloumi and zucchini to add texture and flavour to the keto chicken pattie. 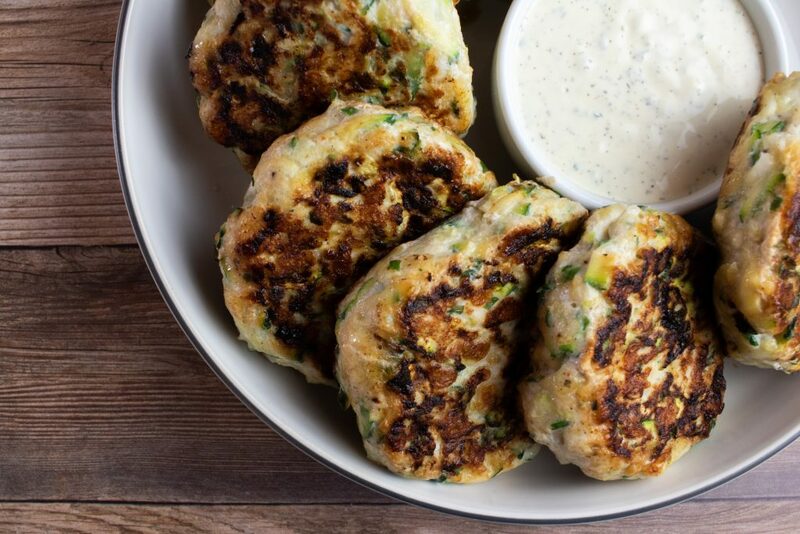 At only 2g of carbs for 2 patties, these are the perfect low carb meal. Make up a batch of these burgers as part of your keto meal prep and you will have a delicious meal ready to go during the week. They can easily be stored on the fridge or freezer. This keto chicken burger recipe came about after my brother told us about these delicious burgers his wife had been making. He explained what was in them and that he thought they would be something we would be able to eat. 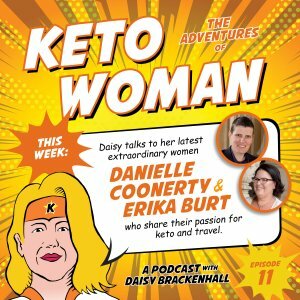 His wife has some intolerances and wanted to find a burger that suited her health needs and that Josh would eat. They were both keen for us to experiment with the recipe and come up with our own tasty recipe. Erika loves chives, so she added them for some extra flavour. 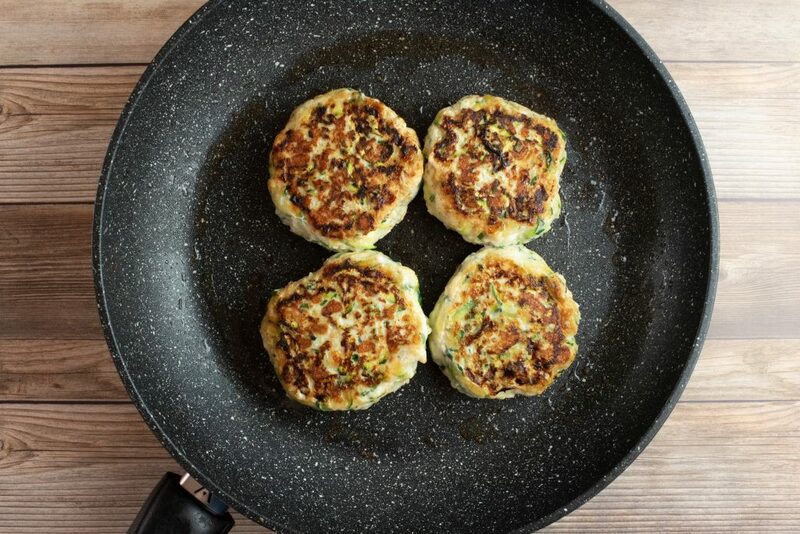 Josh and his wife have since tried these keto chicken burgers and they were impressed with the results. We love to pair this keto chicken burger recipe with our ranch dip to make a tasty keto chicken burger lettuce wrap. This is where you get to be creative and make up your favourite burger toppings. Burgers are such a great keto meal. All you need to do is remove the bun. You can replace the bun with a lettuce wrap or these delicious Diet Doctor low carb rolls. Erika is a big fan of a burger in a bowl, so she likes to have shredded lettuce on the bottom and then top that with the burger patties and her favourite toppings. Dan prefers to pick her burger up and therefore prefers to have it in a lettuce wrap or on a low carb bun. Whilst traveling in the US, we found bunless burgers or protein style burgers to be the easiest option when eating out. All the burger places we went to would happily sub the bun for a lettuce wrap or a burger bowl. Even at the airport, we were able to get bunless burgers without too much of a drama. Burgers are a Friday night treat at our place. 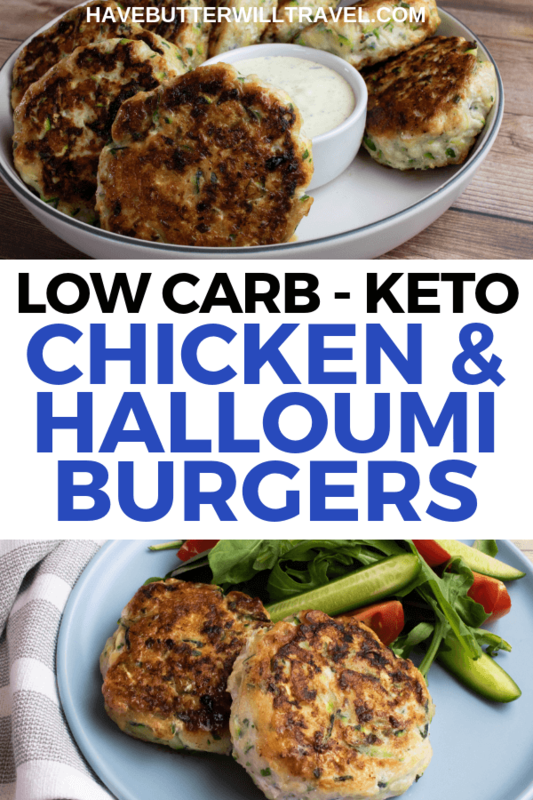 We love these keto chicken burgers and we also really enjoy these carnivore burgers. When we have burgers, we build our own. That way we can have what we want on burgers and we are both happy. When mixing the ingredients, make sure you mix them well so they stay binded together. You can cook them in the frying pan, or the BBQ. We really enjoy cooking on the BBQ and these grill up well. When grating the halloumi, we like to use the thicker grater. It can also be a little messy to grate the halloumi. On their own. You don’t have to make these into burgers. They are just as good as a chicken patty on their own. Place in a lettuce wrap and top with your favourite burger toppings. 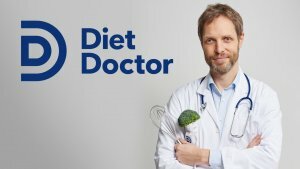 Place in a low carb burger bun, like these from Diet Doctor. We love these rolls. 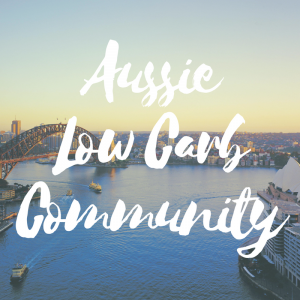 There are easily the best low carb buns we have tried and believe me, we have tried a few. Sauces like sugar free tomato sauce, sugar free BBQ sauce, ranch dip and mustard. 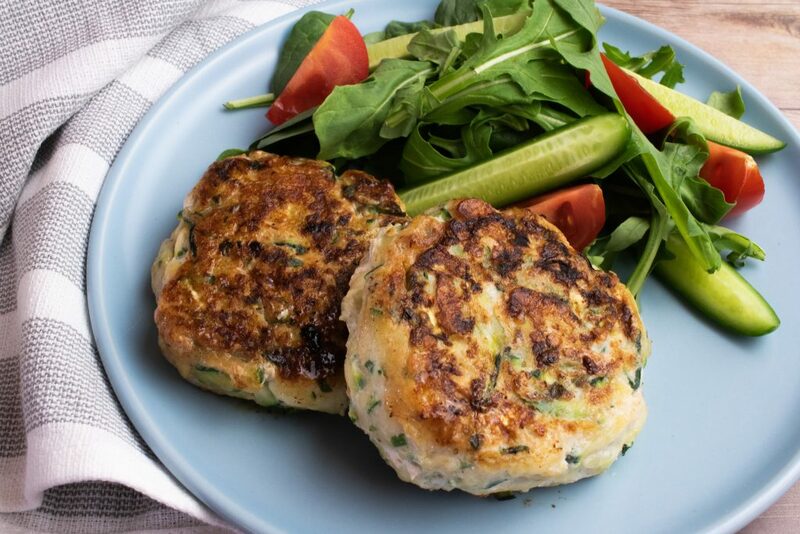 These keto chicken burgers combine chicken mince, zucchini and halloumi to make a tasty chicken pattie. Feel free to get creative when making these burgers. Add your favourite burger toppings for your own custom made burger using some of the suggestions above. Thanks to Josh for this recipe inspiration. 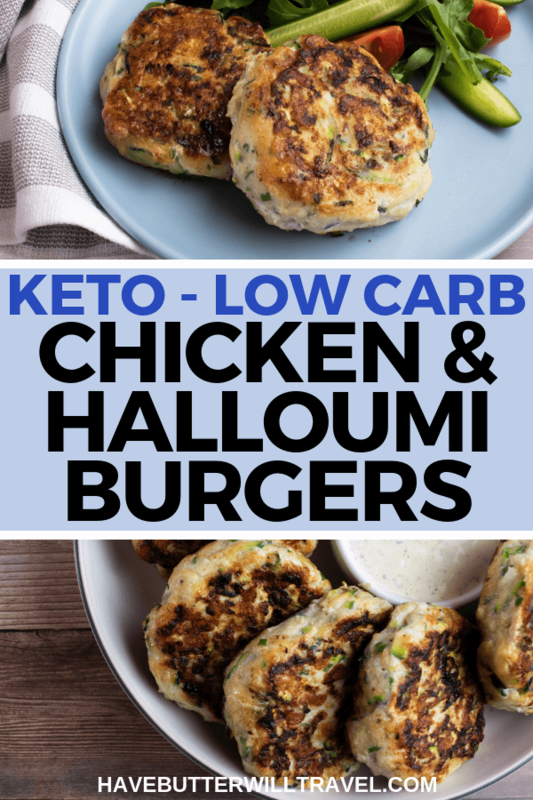 These keto chicken burgers an excellent low carb option for dinner. 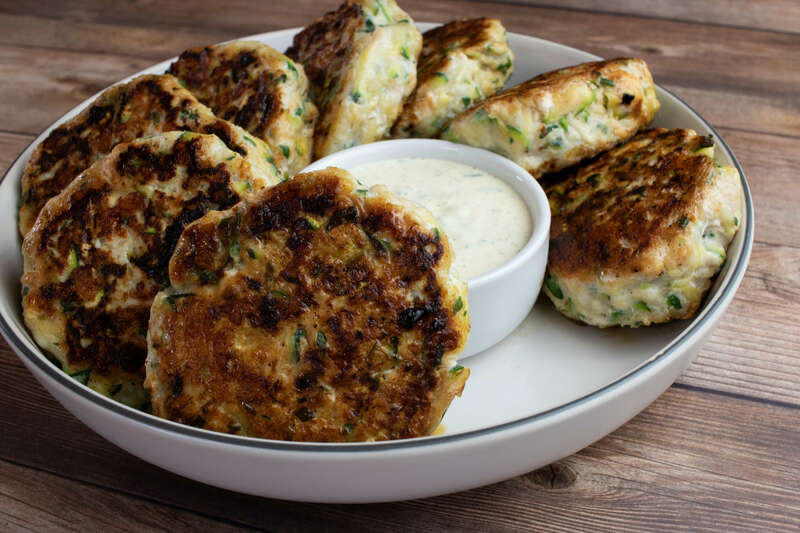 These burgers use halloumi and zucchini to add flavour and texture. These burgers are totally awesome !